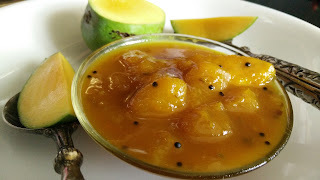 Aam ki Launji / Kairi ki Launji - A sweet and sour dish which can be served along with main course. 1. Heat oil in a kadai and splutter mustard seeds methi dana. Add aesfoetida, cut mango pcs, fennel seeds, all spices. 2. Add 2 cups of water and cover the kadai and cook for 15-20 min till mangoes become soft and tender. 3. The add jaggery and cook for another 15 min till the gravy becomes thick. 4. Consistency of the gravy can be adjusted as per taste. 4. Digestive aam ki launji is ready.